This M&H Racemaster Cheater Slick is DOT approved for street driving, and features a bias ply construction, just like a regular racing slick. M&H Racemaster Cheater Slicks offer great performance and a sizing range that boasts models that will fit within most stock wheel wells, to tubbed street cars to high performance cars with big brakes including Corvettes and other late model performance cars. M&H Racemaster Cheater Slicks are a DOT approved, special order, wrinkle wall, tube type tire designed for dry pavement racing only, and utilize M&H Racemaster’s proprietary “sticky” HB11 compound which is perfect for street/strip cars! 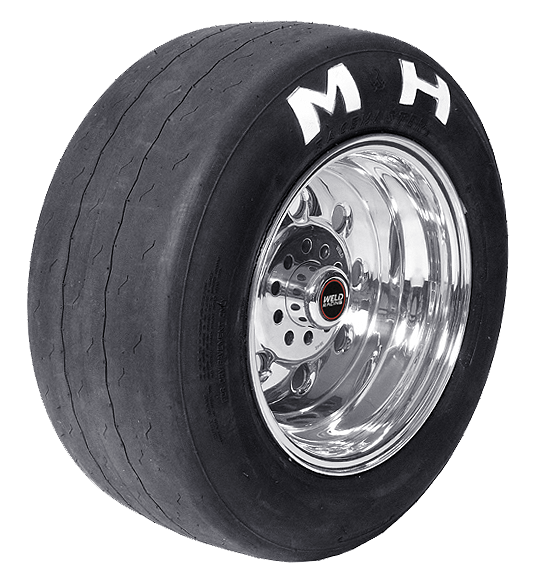 M&H Racemaster engineered the first purpose built drag racing tire the 1950s, and still makes highly competitive tires for multiple drag racing and street applications – all of which are made in USA!